Disclaimer: I was given the product in this post for the purpose of review. I was not paid in any way to write this review. All opinions are my own. Ok I admit I've never seen Sesame Street before so seeing Elmo for the first time was strange for me. What and who was he really? He's big, red, has big eyes and an even bigger mouth. I've never seen anything like him before. Everyone seemed to know who he was but me. WHO IS HE? 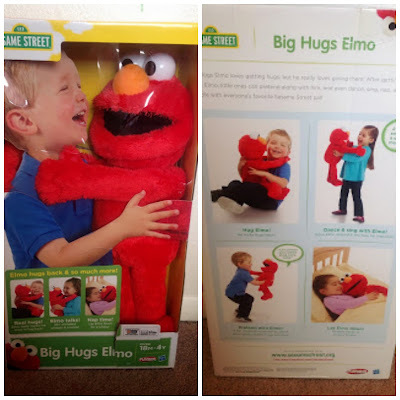 Well I heard mommy say that this was the Playskool Sesame Street Big Hugs Elmo. Apparently he's supposed to be the new biggest thing since Tickle Me Elmo. Did I miss the memo somewhere? Now who was Tickle Me Elmo? I've never heard of him either. Apparently I'm too young to know about him as well but my siblings sure do know who he is. I guess it doesn't always pay to be the baby huh? Well he's suitable from age 18m - 4+ so he's perfect for me, well almost since I'm only 17 months. Big Hugs comes in a big box but he's very easy to open. Mommy hates to open toys that comes with those hard plastic and has wires but she didn't complain with this one. She said this was one of the easiest toy she has opened in a long time. I'm already loving this big red guy. Well once he was out of the box, guess what? He needed batteries. 4AA batteries to be exact. It was a good thing that mommy keeps batteries on hand otherwise it would have been a trip to the store to get some so Elmo got lucky. Store Elmo on his back or upright with arms in a natural resting position. Ok for little ones such as me I won't be able to remember that warning, actually I couldn't even read it but mommy was kind enough to for me. I guess I now have to be careful when playing with him. He does not have a try me mode so if you're planning on picking him up in the store you would have no idea what he does. That's where I come in! Yay me! Ok here goes: Once Elmo's battery goes in he has an OFF/PLAY/SLEEP switch in the back. Turning him to play activates him and he immediately starts talking. He said "hi friend", I now have a new friend. Move over Kitty, Big Hugs Elmo is now my friend. He wanted me to give him a hug but my little arms couldn't hug him tight enough, he kept asking me to hug him tighter and tighter until mommy stepped in. Hey Elmo I'm not strong enough yet to hug you that tight, sorry. Know what's funny? He's programmed to say that so mommy didn't need to do it. Well back to his play mode. There is one other way that I can also play with him. Big Hugs Elmo has a pretend mode that you can activate by pressing on his left foot. He can now pretend with me to be 4 different things and he encourages me to pretend along with him. Pressing his foot each time takes us to each of the different "pretend stations" as mommy likes to say. When I was done playing with Elmo I laid him on his back like they said to do and Big Hugs Elmo said "nighty night friend I'm getting sleepy" and then he sung a nice little lullaby, went to sleep and started to snore. Well I think he was sleeping because I've never heard anyone snore while awake. I love Big Hugs Elmo, he will be celebrating our Independence Day with me while we grill, play games and jump in the pool. Hopefully the water is warmer today than it was yesterday. There are no small parts for you to be worried about with Big Hugs Elmo so he is perfectly suitable for little ones younger than 18 months like me. 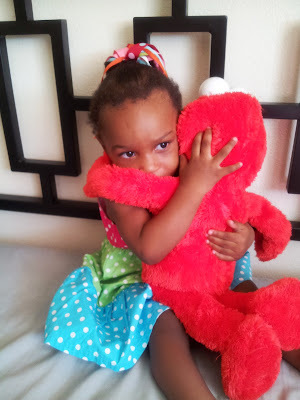 Big Hugs Elmo will be available for purchase on August 1st. We think he'll make the perfect birthday or Christmas gift. Tell your little one Madison recommended him and that she gave Big Hugs Elmo Two Tiny Thumbs UP! Congratulations on getting Elmo! He should be so much fun. I love his cute little voice! it's not that hard to love elmo. I've always been a fond of him as a kid! THat's some fun RED to add to the red, white and blue today! Happy Independence Day! Yes it ships from Amazon on August 1st I believe initially it was September but Amazon is shipping on August 1st. Aw how cute. The kids are big fans of Sesame Street and the adorable little red monster. This Elmo looks huge. The hugging song Elmo sings is so adorable. Serenity LOVES "Melmo", but I'm pretty sure this would scare the daylights out of her. It took almost a month for her to stop bursting into tears every time she saw the ladybug pillow pet my grandma sent her! #sigh She's generally pretty fearless, but big toys that move or talk are a bit much for her yet, apparently. I'm glad you like your Elmo, Madison! You look super cute in that picture!